Phase 2 of the Second Ave. Subway, shown here in blue, has gotten an infusion of cash in the New York state budget. So that he can claim credit for passing the New York state Budget “on time,” Gov. Andrew Cuomo, Senate Majority Leader John Flanagan, Senate Independent Democratic Conference Leader Jeffrey Klein, and Assembly Speaker Carl Heastie came together on Thursday night to announce a budget deal. Everyone in New York State politics is working feverishly through massive documents to understand what’s in and out of the $145 billion behemoth, but we have a clear view of the transit implications. Mostly, the story shakes down as we expected with few actual dollars for the MTA and a false sense of “parity” with spending on upstate roads ruling the day. “This $27 billion agreement marks the largest investment ever made in the MTA. It is an important victory not only for New York City and its suburbs but for all the communities across New York State. The plan will enable the MTA to maintain critical infrastructure while renewing, enhancing and expanding our system to meet the ridership and growth demands of the future and improving the current experience for the millions who critically rely on our system each day. Most of this is what we call pure puffery, but the last sentence is key. The MTA is going to submit their third version of the capital plan — and it will actually restore an important item cut from the last iteration. That’s right; Phase 2 of the Second Ave. Subway is back, baby. The MTA has gotten a commitment of an additional $1 billion from the state for this phase, but the investment nods at the bifurcated nature of the plan. The current budget will allocate an additional $500 million to Phase 2 so that the MTA will have $1 billion for Phase 2 under the 2015-2019 plan. This should be enough to complete all studies and design refreshes necessary and begin utility reconstruction by the end of 2019 which MTA sources have indicated is an aggressive but doable timeframe. The remaining $443 million will be a part of the state contributions to the 2020-2024 capital plan in recognition of the reality that Phase 2 won’t be completed until the mid-2020s. After significant blowback when the MTA essentially moved $1 billion of Phase 2 funding to the 2020-2024 plan by eliminating from the 2015-2019 plan, Assembly members Rodriguez and Wright (that is, Robert and Keith and not Alex and David, as baseball fans would hope) were instrumental in securing these funds for the MTA and their constituents. They issued a statement this afternoon. “The restoration of significant funding for the Second Phase of the Second Avenue Subway represents a huge victory for the residents of East Harlem,” Rodriguez said. So what comes next? The fight for an actual source of dollars for the capital plan will continue; the MTA will submit a revised plan and hope to avoid debt; and Phase 2 of the Second Ave. Subway is exceedingly likely to become a reality within the next decade. It all sounds good, but next week, we’ll take a look at what Paris has planned to open before 2030. And then we can wonder how New York City went so far off the rails. In the meantime, tonight is but one step in a continuing saga. As the legislative stalemate over the MTA’s current five-year capital plan nears the start of its 16th month since spending for the plan was due to begin, New York Gov. Andrew Cuomo has repeatedly had the audacity to claim an unapproved plan was in line with business as usual for the MTA. He has cited to the 2010-2014 plan as proof, but he has failed to draw an apt analogy. With the world mired in a recession, the MTA’s previous five-year plan was approved in two parts with the state’s Capital Program Review Board authorizing two years and then three for a full five-year plan. This time around, the CPRB has even had the chance to weigh in on the current five-year plan, and even as negotiations around certain projects continue, Cuomo has failed to deliver on repeated promises to fund the plan. A few weeks ago, shortly after MTA CEO and Chairman Tom Prendergast was summoned to Albany to talk MTA finances, I explored how Cuomo’s MTA funding reality have failed to live up to his promises, and now, we learn the bad news: If the MTA capital plan is not approved by the end of June, the agency will not be able to access money to pay contractors for new projects. This deadline does not affect in-progress projects where the money has already been allocated (such as the first phase of the Second Ave. Subway), but without approval key initiatives, including future phases of the Second Ave. Subway, will be delayed further. In fact, one of the reasons why the MTA’s plan to replace the MetroCard has come to a near-stop is due to the fact that the agency cannot yet access funds for the project. The problem, as I’ve detailed, is that Cuomo’s current budget proposal doesn’t include any real commitments to MTA funding. He wants the agency to tap out its essentially limitless ability to fund through borrowing before ponying up any dollars. It’s an IOU, and in response, the Riders Alliance attempted to pay for subway rides with IOUs as well. It didn’t work, and Cuomo’s plan shouldn’t be allowed to stand. To put an additional bow on this present, after months of listening to upstate complaints about parity, Cuomo’s budget includes billions in actual dollars for New York State DOT projects (in other words, roads), and the parity argument falls apart under any sort of scrutiny. As the Riders Alliance recently detailed in a report, the state is promising over $5 billion more to roads while the MTA regions are expected to pick up $11 billion in capital funding. Upstate municipalities with pending DOT projects aren’t kicking in any money at all, and on paper at least, New York is funding 59 percent of of DOT’s five-year plan with direct contributions while Cuomo has pledged to fund only 31 percent of the MTA’s five-year program. The state legislature is expected to pass some budget measure by the end of this week, and the MTA’s financial picture will come into focus. 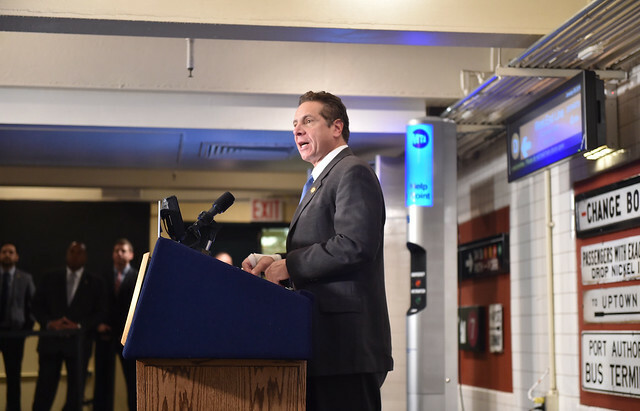 Even with some renewed attention to a tolling/congesting pricing plan, the outcome of this week’s discussion won’t be satisfying for the MTA and its millions of customers, and the game of chicken Cuomo is playing with subway funding is costly for everyone involved. It raises the issue of whether New York City should have more control over its subway system, but the funding obligations that come with such a move are steep. Where we go from here should echo throughout the next years and decades, but I’m not sure anyone should hold his or her breath over a positive outcome this late in the game. When it comes to Gov. Andrew Cuomo and transportation funding, I’m not buying what he’s selling, and now, with details finally emerging three months after he announced a pledge to fund the MTA’s still-unapproved 2015-2019 capital plan, no one else is either. What started out as a promise to fund $8 or $10 billion of the plan via state sources has turned into a business-as-usual approach to the capital budget. Most of the state financing will come via debt, and it will fall on the shoulders of the riders through increases in debt service obligations that will eventually be a leading driver of future fare hikes. It’s not newfangled support from Gov. Cuomo and, coupled with his recent giveaway to New York drivers, it’s a far cry from the parity upstate politicians spent the fall whining about. For weeks, as Cuomo conducted his infrastructure tour of New York State, pledging to see through lots of pretty projects without funding behind them, whispers of debt filled the air, and when he spoke at the Transit Museum on Friday, Cuomo even mentioned the dreaded d-word as the likely driver behind state contributions to the MTA’s capital plan. “Part of it is debt. Part of it is revenue,” he said to reporters, about state contributions to the MTA. On Thursday, City & State reported that the state is essentially kicking the can down the road on funding. As Jon Lentz detailed, the state’s budget documents promise funding “only when the MTA’s capital resources have been spent down,” and budget-watchers don’t like this language. In other words, once the MTA is no longer able to borrow a single dollar more, the state will step in. That’s a terrible plan and one that will surely lead to some combination of significantly higher fares or worse service. In fact, as Charles Komanoff wrote earlier this week, fares could increase by as much as 12 percent simply to fund new debt service obligations, and that figure is an additional 12 percent on top of the MTA’s regularly scheduled biennial fare hikes. Instead of some sort of equitable funding solution — such as Move New York’s fair tolling and traffic pricing plan — Gov. Cuomo has come up with nothing and is taking a lot of credit for it. It’s a veritable house of cards, and the wind is starting to blow. Meanwhile, Cuomo has also pledged $22 billion to upstate roads, and a significant portion of that will be direct state contributions. When you consider as well that Cuomo is freezing New York’s already-low per-mileage Thruway tolls at current levels for the foreseeable future, the state’s current funding mix — including imposition of debt obligations on relevant agencies — heavily favors roads and drivers over rail lines and their passengers. Is this what Cuomo meant last week when he stressed the need to encourage transit use, especially in downstate areas? Color me discouraged. Open gangways on the Berlin U-Bahn's U6. These so-called großprofil cars are spacious, and the design does wonders for passenger flow and crowding. When the MTA released its revised capital plan earlier this fall, a few tidbits caught my eye. Although I mentioned them via the Second Ave. Sagas Twitter account, I failed to write the follow-up posts. So let’s revisit these items, starting today with the promise open gangways. The concept of rolling stock with open gangways — articulated train sets — is one of those not-in-New York ideas we’ve come to know and warily examine over the years. The MTA has issued numerous excuses — tight curves, safety concerns that were valid 25 or 30 years ago — that seem to ring hollow, and every now and then, the agency nods at the idea of five-car sets with open walkways. The last serious consideration came in 2013 when the MTA’s 20-year needs document acknowledged the benefits of rolling stock with open gangways. For the MTA, a design with open gangways is a long overdue need. It’s an easy way to boost subway capacity by, as we explored earlier this year, around 8-10 percent per subway train without increasing the frequency of a line, and as anyone who’s ridden the rails at rush hour lately can attest to, any capacity increase would help. So what’s the plan? It is, of course, a pilot. According to the revised MTA 2015-2019 capital plan, the agency would purchase 10 open-gangway prototype cars with the $52.4 million expenditure allocated for 2016. For now, these prototypes are lumped in with the R-211 order that is supposed to start replacing the R46s over the next few years. It’s not yet clear where the MTA would run the open gangway prototype cars, how these cars would be designed or what the future holds for open gangways. When I last asked MTA officials about such a design, they told me that certain curves in Lower Manhattan may preclude running rolling stock with open gangways on all lines but that the MTA is committed to testing and, if possible, implementing a design with open gangways in the future. Whenever this topic comes up, the usual complaints and critiques arise. In a Times article in 2013, the generation that remembers the Bad Old Days worried about crime. “Remember the time when we were in the high-crime era and gangs were roaming through the trains?” MTA Board member Andrew Albert said to Matt Flegenheimer. “Everybody loved the locked end doors.” Subway crime, of course, is at all-time lows and shows no signs of any meaningful increase. It ain’t the 1980s any longer. Meanwhile, others have complained about disruptive buskers and the odors from homeless subway residents rendering half a train inhospitable rather than just one subway car. To this, I say it is New York exceptionalism at its finest, and we are not the special butterflies some would have us believe we are. These open gangways were standard operating procedure on the train lines I experienced in Berlin, Stockholm and Paris this past summer, and they worked great. Passengers could spread out through multiple subway cars, and the buskers moved on. Solving the homeless problem also shouldn’t prevent us from solving the more important capacity crunch, and as rolling stock comes up for replacement, eking out additional space via efficient design should be a priority. So do we dare get our hopes up? Only 10 of the next 950 cars the MTA plans to order through the next capital plan will feature open gangways, and those that come online over the next few years will be expected to last another four or five decades. In other words, it’ll be a while before articulated train sets become standard. But this is a start, and a start is more than what we’ve had in the past. Phase 1 of the Second Ave. Subway project may open by the end of 2016. How much longer will we have to wait for the rest? When the MTA first published its 2015-2019 Capital Program toward the end of last year, it seemed that Phase 2 of the Second Ave. Subway would soon see the light of day. Without pinpointing the total funding need for the stretch of the line that will run from 96th St. and 2nd Ave. to 125th St. and Lexington, the MTA had proposed a $1.5 billion line item that included project management and design, real estate acquisition and initial tunneling. The best laid plans would have seen initial tunneling being in 2019 with the remainder of Phase 2 funded in the 2020-2024 capital plan. And then nothing happened. Governor Andrew Cuomo, the ultimate arbiter of all things MTA in New York State, didn’t make an effort to ensure the capital plan would be funded until mid-summer, and even then, he used the MTA to wage a petty political battle against the city and Mayor Bill de Blasio. By the time the two leaders set aside their childish fighting, nearly a year had elapsed between the MTA’s initial proposal and ultimate approval of the capital plan. For the MTA, this year meant uncertainty over funding and an inability to move forward on projects for which dollars were not guaranteed. Phase 2 of the Second Ave. Subway was one of those casualties. When the MTA unveiled its revised 2015-2019 Capital Program last week, funding for the Second Ave. Subway had taken a big hit. Instead of a $1.5 billion request, the agency now included just over $530 million — still a lofty sum and one that would cover the full costs for Phase 2 were we in, say, Paris or Madrid — but the $1 billion cut was the single biggest reduction in the revised plan. The $535 million would fund “environmental, design, and real estate and project support to undertake preliminary construction work, such as utility relocation.” The MTA still plans to build Phase 2, but after a 13-month delay in capital funding approval, they claim to no longer have the time or resources available to spend $1.5 billion on the project before the end of 2019. With fewer dollars available, the MTA could make the decision to ask for more in four years. And then everything hit the fan. Fallout was loud and angry with politicians accusing the agency of further delaying a massively delayed project, and the optics of withholding money for the Harlem-based sections after building the route through the Upper East Side looked even worse. If you take the MTA at its word, the agency still plans to build Phase 2 when it can, but the when looks a little more distant today than it did a year ago. Plus, New Yorkers aren’t keen on trusting the MTA. Can you blame them? The two members of Congress posed a series of questions that need to be asked. They questioned the timetable for Phase 2 — something that is currently a real mystery. Noting that the MTA hasn’t yet requested federal dollars, a move that would commit the agency to build all of Phase 2 or refund a billion dollars to the feds, they asked when the agency plans to apply for New Starts money and enter into a full funding agreement. And importantly, they asked about the total expected cost, another mystery. The mayor, as you may recall, recently promised to contribute over $2.5 billion to the MTA’s capital program. Apparently, he wasn’t concerned enough with the details to follow up on how the city’s money will be spent and whether the MTA should be focusing on certain priorities. It is another move that shows the mayor’s lack of attention to transit matters, and it gave Cuomo, via Prendergast, the opportunity to ding de Blasio. In his statement, Prendergast highlighted how Trottenberg a week ago had called the new capital program a “very terrific capital plan.” What a mess. At this controversy continues to boil, I hope New York City’s political representatives can learn a thing or two. First, paying attention to what the MTA is doing before it gets too late to do anything to change it is important. Imagine if Maloney and Rangel used their influence years ago to find out why Phase 2 planning hadn’t yet begun. Imagine if politicians were willing to hold the MTA’s feet to the fire on the outrageous costs associated with these capital projects. Imagine if de Blasio were to pay attention to transit spending priorities before they become news and not after. Imagine if the MTA were engaged in an aggressive effort to build out the Second Ave. Subway as fast as possible rather than as slow as possible. It is also not too late to right this wrong, but it will take considerable political effort and a lot of money. Phase 2 may now not finish until 2025 or beyond, and Phase 3 — the southern part — was originally supposed to take another nine years to complete. Maloney and Rangel should question that work as well. How much longer can we wait? The MTA has a penchant for angering everyone. Whether it’s rush hour delays or crowded trains or fare increases, the agency is not high on New Yorkers’ lists of favorite things. But rare are the days when a line item in a budget draws as much ire as the MTA’s move to cut $1 billion in funding for Phase 2 of the Second Ave. Subway did on Thursday. Even though the agency still plans to spend half a billion dollars on design prep and real estate acquisition before 2020, lingering doubts over the project’s future have pushed this move onto front pages around the city. In a certain sense, the MTA is trying to be practical. That there is a gap of at least three years between the expected revenue service date for Phase 1 and the date they can start construction work on Phase 2 is an indictment of other issues with the MTA’s ability to execute on large problems and plan appropriately. 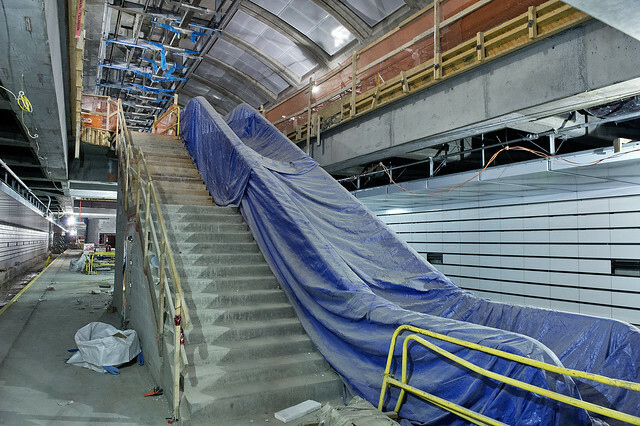 The MTA should have ensured that design work for Phase 2 was wrapped by the time Phase 1 opens so that the transition to work on the next section would be seamless. But the opportunity has passed. Instead, the MTA will prep everything necessary to start work during the 2020-2024 Capital Program. That is, if you take the agency’s word at face value, and few do. As the implication of the $1 billion reduction in spending sunk in on Thursday, no one was happy. Some noted that the MTA would no longer be applying for federal grants that may or may not be available in five years. Others worry that this is the beginning of the end of the Second Ave. Subway. After 100 years, we’ll get three stations and nothing else. In comments to WNYC’s Kate Hinds, he called the move an “economic injustice.” Relying on Rodriguez’s statements and words from others, Hinds wrote a fantastic and comprehensive rundown of the move which included a look back at how the MTA used the Second Ave. Subway to court money from the mayor and then cut the planned funding once the mayor ponied up the money. It is a must-read on this subject. In other coverage, The Times wrote about the near-universal condemnation of the funding move, and even the New York Post editorial board, hardly a bastion of bleeding-heart liberals, noted the class issue inherent in the MTA’s decision, even if they used to bash de Blasio again. How do you build a subway line through the Upper East Side while delaying the one through, as Rodriguez put it, “a lower-income community that certainly needs the access as much as the first phase”? So what exactly can the MTA do here? They don’t have time to restructure the capital program again. In fact, the funding battle between the Mayor and the Governor which led to a delay in approval of the capital plan is a major reason why Phase 2 is being shifted from the 2015-2019 plan to the 2020-2024 plan. The MTA simply couldn’t execute because the agency didn’t know how much money it would have. What they can do is stress a firm commitment to building Phase 2, secure the promise of federal dollars and look to put shovels in the ground as soon as possible. It’s not a perfect solution, and it raises the question of why Phase 2 isn’t ready to start the day after Phase 1 wraps. But it may be the best they can do. Either way, this has become a major flashpoint issue, and there’s no easy way out.